The other week we ran this post about a special offer for a FREE LED dog collar. We wanted to remind you that it is not too late to get your FREE pet collar (just pay for shipping and handling). This is a great product for anyone who owns a dog who likes to wander off when it is dark outside, or who owns a dog who has mastered the game of hide and seek at night! To get your FREE LED dog collar, simply enter the discount code 15OFF at check out. Remember, you do need to pay $7.95 for shipping and handling in order to get these FREE dog collars. A few weeks ago we ran this post about how you may be able to get a Zales jewelry store gift card worth $1,000. We wanted to remind you that you still have time to submit your email address for a chance to receive this Mothers Day gift card. If you are chosen to receive this awesome Zales gift card, you will be notified by the email address you provide. Just think of the beautiful gift you could get for your mom if you receive this gift card! Zales has a wide variety of beautiful rings, necklaces, bracelets, earrings, pendants, and more. Be sure to enter this Zales Mothers Day card offer before time runs out! REMINDER! It Is Not Too Late To Get Your Starbucks K Cup Sample! The other week we told you about this offer for a FREE sample of Starbucks K Cups. We wanted to remind you that you still have time to take advantage of this javalicious freebie offer! To get your freebie, all you have to do is select the coffee sample you would like to receive, complete a brief form, and submit your request! Getting your freebie is that simple!! You can choose from Dark Roast Tasting Flight, Medium Roast Tasting Flight, or Lighter Roast Tasting Flight. Once your form has been submitted, you can expect to receive your coffee sample in the mail within 4 to 6 weeks. 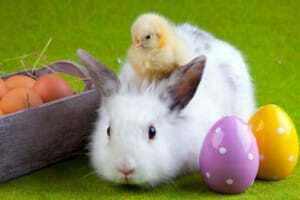 Reminder: Don’t Forget Your FREE Easter Bunny Photos At Petsmart TOMORROW! A few weeks ago, we ran this post letting you know that on Saturday, April 8 your dog could get a FREE photo taken with the Easter Bunny at a Petsmart location near you. We wanted to remind you that tomorrow is the day to take your dog to Petsmart for the FREE Easter event. In addition to FREE photos with the Easter Bunny, there will be fun activities for your children to complete. There may even be freebies for your dog besides the photo with the Easter Bunny. This event will take place from 12:00 PM until 4:00 PM. Don’t forget, this FREE event will be held tomorrow only! Reminder: Give Your Child a Barbie Star Light Adventure Hoverboard Without Spending MONEY! 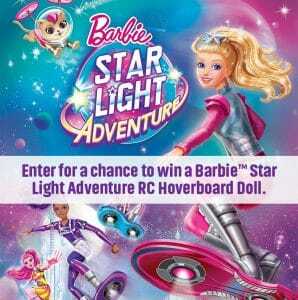 The other week we ran this post about the Barbie Star Light Adventure hoverboard giveaway. We wanted to remind you that you still have time to enter the giveaway! If you are selected as the winner, you will receive a FREE Barbie hoverboard valued at $60.00! This giveaway ends on Saturday July 31, so be sure to enter while you still have a chance to do so. The Barbie Star Light Adventure hoverboard will be featured in the upcoming Barbie movie that many children are very excited to see! Can you imagine if you won this awesome giveaway and were able to give your child this fun toy without having to spend a single penny?? It could happen! Your chances of winning will depend upon the number of people who enter the giveaway. This fun Barbie hoverboard toy can be used to fly a Barbie around- outside, inside, or any other location in which you can safely fly a Barbie! Use the remote control to determine where Barbie will fly in her adventures on her Star Light Adventure hoverboard! Kids can really use their imagination when they play with this toy. Don’t miss your chance to enter this awesome giveaway before it ends on Saturday! Reminder: FREE Shopkins Activity And Freebies At Toys R Us! Earlier this week we ran this post about the FREE Shopkins Swap-kins event at Toys R Us on Saturday, May 28. We wanted to remind you that tomorrow is the fun, FREE event! Visit a Toys R Us store tomorrow between 10:00 AM and 12:00 PM and your child will receive a FREE mystery Shopkins collectible item as well as a FREE Shopkins trading tray. 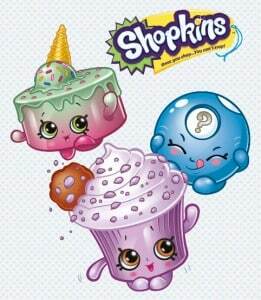 You child can also bring Shopkins to trade with other children. Reminder: FREE Mudslide Cookie At Au Bon Pain Tomorrow! The other week we ran this post about a special offer for a FREE small double chocolate cookie at Au Bob Pain on May 10. We wanted to remind you that tomorrow is the day to get your delicious cookie freebie! Stop by your local Au Bon Pain to get a FREE cookie between 2:00 PM and 5:00 PM. No purchase is necessary. This offer is limited to one per person. 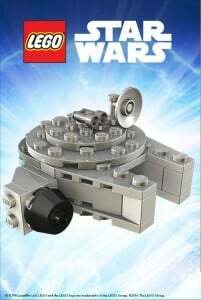 Reminder: FREE Mini Lego Millennium Falcon At Toys R Saturday! Earlier this week we ran this post to let you know that you can take your child to Toys R Us this Saturday (May 7) to get a FREE Mini Lego Millennium Falcon. We wanted to remind you that tomorrow is the day to take your child to Toys R US to get the FREE LEGO mini and some other cool freebies. This event runs from 12:00 PM until 2:00 PM at all Toys R Us stores. 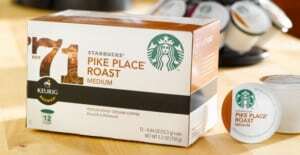 Reminder: Request A FREE Coffee Sample from Green Mountain Coffee! A few weeks ago we ran this post to let you know that you can get a FREE sample of Green Mountain Coffee. We wanted to remind you that it is not too late to get your coffee sample in the mail! To get your freebie, just complete the sample request form. When you do, your coffee sample will arrive in your mailbox within a few weeks. A few weeks ago we ran this post about the AARP Travel sweepstakes. 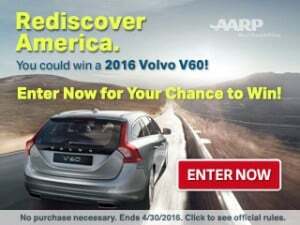 We wanted to remind you that it is not too late to enter the AARP sweepstakes for your chance to win a new 2016 Volvo V60 Cross Country or vacation for two on a National Parks of America tour. You have until May 1 to enter this awesome sweepstakes!